We always hand make our Christmas Cards. Who needs another generic Santa or Rudolph swinging from their piece of string across the windows this Christmas? Whilst we'd love to create gorgeous artisanal Scandinavian treasures, that particular talent doesn't appear to be in our genes in this house. Still, what we create with Clag glue, pearlised card stock, organza ribbon and a ballpoint pen, isn't all bad. We're fans of the monochromatic, tone-on-tone style Christmas here, so we figured our hand made cards should reflect that. Position the cookie cutter on your card. Paint the inside of it with the glue. Sprinkle liberally inside the cookie cutter with glitter. Leave to sit for a minute or two to dry. Tip the excess glitter back into your container. Tidy the edges with a skewer. Tie a lavish bow along the folded edge. Hand write your preferred Christmas slogan on the front. 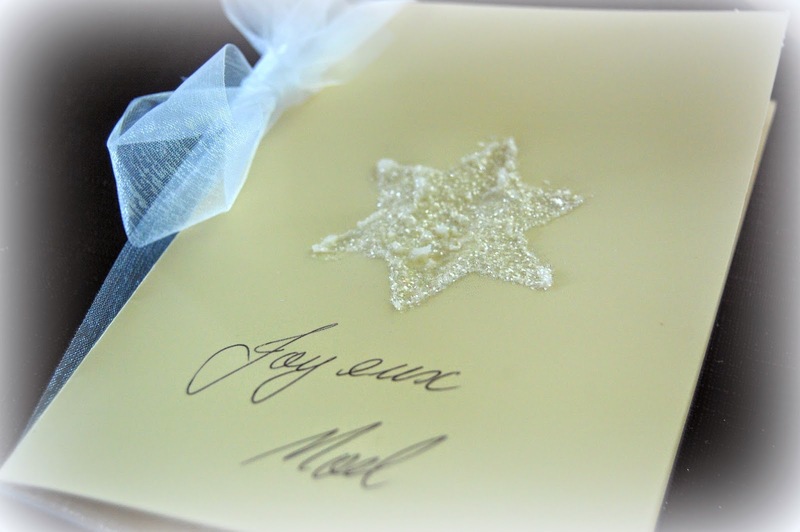 We inscribe the inside simply, adding foil stars and tags with Christmas wishes on them to fly out upon opening. Things like 'Be Merry', 'God Bless', 'Enjoy the Season' and so on. We like our little cards. 'Artistically challenged' ....a bit like me being 'straight line challenged'. LOL! We all have our challenges don't we. I love your card. It is very pretty. A lovely design for all those who love to create, especially at Christmas! Thanks for sharing, and hope you have a wonderful Thanksgiving! Finding 50 and Fabulous...the Supplement debate.